Facebook, Twitter, Instagram, LinkedIn, Youtube...a social media overlay is spreading across the internet. Most forward-thinking marketeers are looking to Social Media & Social Networking as routes to their target audience. With these social network cards, you can promote your social sites with ease and attract more people to your social sites. 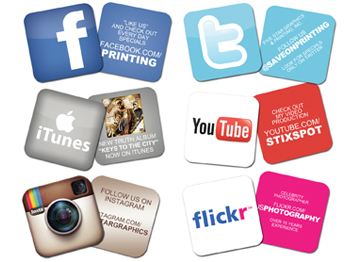 Choose from any social network site and add your own custom text on the back at no extra charge.